1: Department of Geography, University of Waterloo, Canada ; 2: Mpumalanga Parks and Tourism Agency, Lydenburg, South Africa ; 3: Imperta Consulting. More than 50 % of the world's wetlands are reported to be peatlands and mires (mires are peatlands supporting peat forming vegetation), of which only 1% occur in Africa. Nearly 10 % of South Africa 's wetlands could be peatlands and mires and peatlands. Not only do they comprise the largest group of wetlands but they are also recognised as contributing immensely to biodiversity, regulating of hydrological functions, and hosting a third of the earth's terrestrial carbon (Joosten and Clarke, 2002). Most peatlands in South Africa are valley bottom fens occurring in our coastal areas such as Maputaland in northern KwaZulu-Natal and the Highveld areas and along the escarpment. Some peat occurs in hillslope seepage areas and in interdune depressions. Peat is occasionally associated with hillslope seepages (use and example e.g. Maluti Mountains ), interdune depressions, as well as dolomitic and other springs. Pans are endoheric features in the landscape that entails an internal drainage system. They occur from the drier western parts of the country (including the Northern Cape, Free State and Northwest Provinces) to the wetter eastern parts (Gauteng and Mpumalanga Provinces). Pans also occur in the Kruger Park National Park, but the majority are located in the drier western parts of South Africa. The eastern extent of the pan belt in the Highveld is concentrated around the town of Chrissiesmeer. The area is unique due to the high density of pans, several of which are permanently saturated. The pans range in size from less than a hectare to over a thousand hectares (Lake Chrissie). Collectively the pans inside the pan field are known as the Mpumalanga Lakes District (Figure 1). The Mpumalanga Lake District has a fairly high rainfall of 800 mm per annum compared to rainfall less than 200 mm per annum for the pans in the western part of the country. These pans in the west are mostly ephemeral whilst the pans in the Mpumalanga Lake District are more perennial and also less saline. Water sources range from precipitation, run-off and groundwater contributions. Run-off is less important in terms of the regional drainage as the Mpumalanga Lake district occurs within a plateau surrounded by the drainage basins of important river systems that arise around the fringes of the pan field, namely the Vaal River, the Komati River (via the Boesmanspruit), the uMpuluzi River and the Usutu River (McCarthy et al., 2007). However, run-off from the immediate (though small) catchments are locally important for each pan as clastic sedimentation and nutrient input take place from the surrounding landscape (McCarthy et al., 2007). Figure 1. 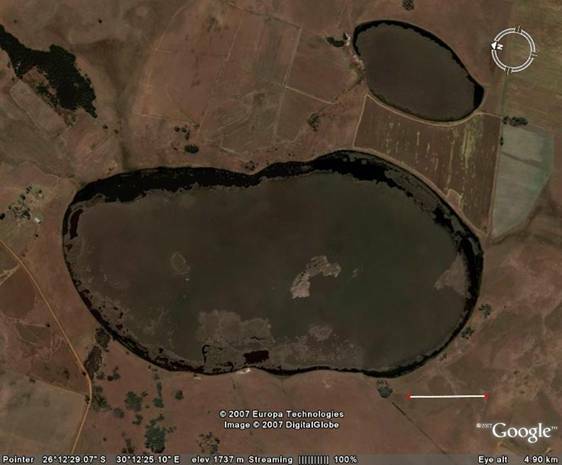 A Google map image of the Mpumalanga Lake District with Lake Chrissie in the centre and Tevreden Pan peatland towards the north (top of image). A total of approximately 320 pans occur in the Mpumalanga Lakes District of which the Tevreden Pan is by far the biggest Pan that is covered by a dense growth of Phragmites reeds (emergents) with a narrow outer ring of open water (Figure 2). The reed pans in the Mpumalanga Lakes District have the most saturated hydroperiod of all the pan-types and usually retain high water levels throughout the year. Figure 2: A panoramic view of Tevreden Pan. This view is from north to south and the outer ring of open water is visible in the foreground. Located in the northern part of the Mpumalanga Lake District is the Tevreden Pan Peatland Complex (S26 o 12'33” E30 o 12'18”), consisting of a larger perennial Tevreden (“satisfied” in Afrikaans) Pan and a smaller perennial one immediate south east of it (Figure 3). The larger pan is approximately 300 ha in extent and the smaller 50 ha. These two pans have always been covered by Phragmites australis (Common Reed or Fluitjiesriet (whistling reed) in Afrikaans) as far as historic records go back. It was thus hypothesised that given the known environmental conditions, the probability of peat being present in the system was high. It was therefore decided to investigate whether or not peat did indeed occur inside Tevreden Pan. Figure 3. 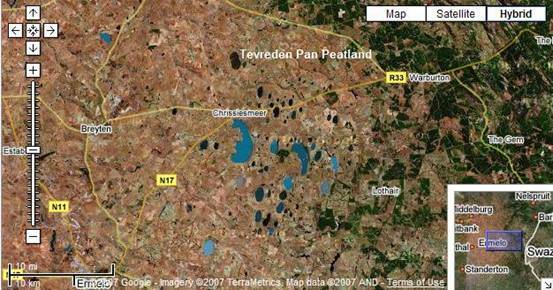 A Google image of the Tevreden Pan Peatland Complex. The white bar represents 500m. The larger pan was investigated on 31 May 2007 and samples were taken with a Russian peat auger. The pan was accessed on the northern side and a stranded floating P.australis reed mat (or raft) was identified and investigated. Figure 4 illustrates an example of such a floating reedbed with a submerged peat body below the surface. The mat comprised of peat consisting of an upper fibrous layer (H1 on the Von Post humification scale : 0-60 cm depth), a less fibrous middle layer (H4 : 60–80 cm depth), and a bottom fine peat layer (H9 : 80 –100 cm depth) (Table 1). A follow up visit in June indicated a water depth of more than 5 m with floating peat of 1.5 m in thickness and accumulated peat on the basin floor of about 0.5 m. Adverse weather conditions made it impossible to investigate the pan further, and a more comprehensive survey is planned for the warmer summer months in November 2007 to January 2008. Figure 4. An image of two floating Phragmites australis reedbed rafts with submerged peat bodies, similar to the peat body identified at Tevreden Pan (Photo taken at Marico-oog in the Northwest Province ). Very fibrous, consist mainly of reeds and sedge. Fibrous, consist mainly of reeds & root mass. An interesting feature of this peatland is that an open fringe of water that exists at present between the shoreline and the P.australis covered floating mat. P.australis in pans is not common in the area and make out only 2.3% of the pans in the Mpumalanga Lake District (Allen, 1985). 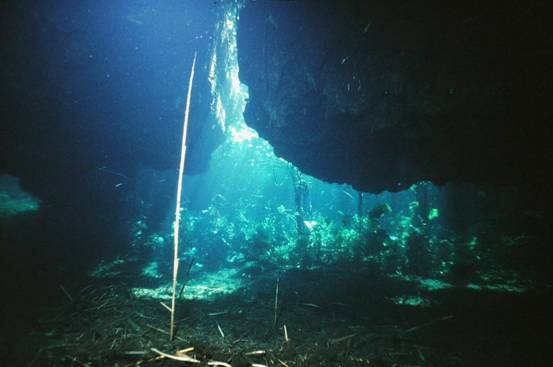 The fringe is between 20 and 150 m wide (Figure 2 and 4) and deeper than 5 m in places. It is expected that the P.australis reedbed will be floating in most places (depending on high water levels) and the peatland is thus a classical example of a lake or open water body being infilled by a floating peat mat and properly quite similar to a kettle hole peatland on the prairies in North America. Another interesting feature of this peatland is that various other wetlands occur within its isolated catchments. These vary from hillslope seepages to midslope/valley head valley bottom wetland systems. Alluvial fans consisting of clastic sediments have developed over time at the valley bottom inlets into the pan. Tevreden Pan consists of a diverse flora, characterised by P.australis, which forms a dense extensive reedbed covering across the larger part of the pan basin. The narrow, peripheral ring of open water is usually underlain with submerging species such as Lagarosiphon muscoides, Potamogeton thunbergii and P. pectinatus., Shoreline species, include species such as Cyperus difformis, Juncus effusus and Chenopodium glaucum. The wetland also support large numbers of diverse bird species such as Podiceps, cristatus (Great Crested Grebe), Anas undulate (Yellowbilled Duck), A. smithii (Cape Shoveller), Netta erythrophthalma (Southern Pochard ), Plectropterus gambensis (Egyptian Goose), Fulica cristata (Red-knobbed Coot), Chalidris minuta (Little Stint), Chlidonia leucopterus (Whitewinged Tern) and Avocet Recurvirostra avosetta (Barnes, 1998) . Peatlands are not common features in the South African landscape. Most of our peatlands are valley bottoms fens with some fens occurring on hillslopes and interdune depressions on the coast. It is to the knowledge of the authors the first time that a peatland has been described occurring in an endoheric pan in the Highveld, interior, of South Africa . The Tevreden Pan Peatland Complex therefore represents a unique wetland type and should be conserved on the highest possible level. Ideally, Tevreden Pan, along with other pans in the Mpumalanga Lakes District should receive Ramsar status, given the uniqueness of the area, which include its status as a globally important bird area (Global IBA: SA019 Chrissie Pans of approximately 62500 ha), as well as its geomorphological and hydrological uniqueness (Barnes, 1998; McCarthy et al., 2007). The need for conservation has become critical with serious new threats posed by a recent open cast coal mining application in the area. The proposed mining activities are regarded by specialists as being likely to cause an irreversible negative impact on pans inside the pan field (McCarthy et al., 2007). Barnes, K.N. (ed.) 1998. The Important Bird Areas of southern Africa. BirdLife South Africa, Johannesburg. McCarthy T., Cairncross B., Huizenga J.M. & Bachelor A. (2007). Conservation of the Mpumalanga Lakes District. Unpublished report. Johannesburg.